The difference between marketing for the internet and marketing for other media is simple: People's attitudes. When you're surfing the 'net for products or ideas, you're ACTIVELY ─ and with intention ─ searching. You're ENGAGED in the process. As you sit on the couch at home reading a magazine or watching TV, you're passive and relaxed. You're NOT actively looking for products and ideas. You're not engaged in any advertisements you see ─ ads you probably didn't ask for. And when you see them, I'll bet a majority of the time you DO NOT have a smile come over your face! Advertising must break through the passive mindset when viewing TV and magazines. For online viewers, persuasion marketing messages ─ of any kind ─ must completely serve the active mindset. Armed with this knowledge, it's time to reveal the 7 Secrets of Online Marketing Strategy. And greatly improve your ability to connect with your audience! 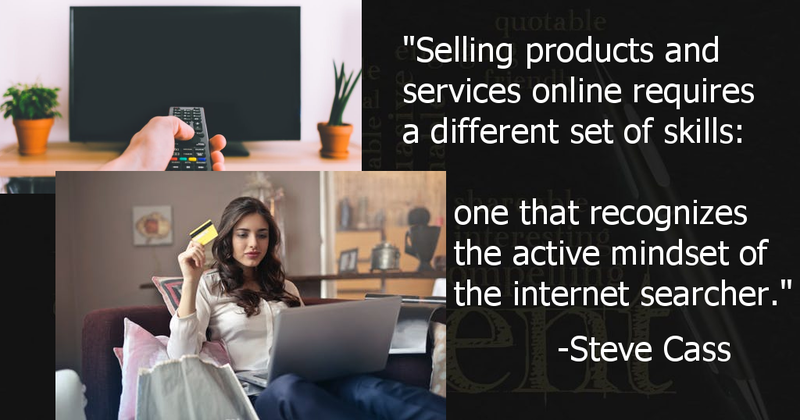 Selling products, services and ideas online require a different set of skills: recognize the purpose-driven mind of the internet searcher. In the days before the internet, there really was only one way for advertising and customer interaction. It's called "Interruption Marketing". This type of advertising is still used ─ for TV and magazine advertising. Not so much for the internet. Actually, it's used on the internet. Way too much, and it's a turn-off. Just my opinion, but when you come across a website that uses pop-overs and auto-play videos: what's the first thing that comes to your mind? According to the Content Marketing Institute, 20% of folks are engaged and 80% distracted by the world around us during Interruption Marketing. But it's the exact opposite numbers when we're searching online: 80% engaged and 20% distracted. Think about how you feel when you're searching for products and ideas on the internet. You're determined to find EXACTLY what you're looking for. The adrenaline surges as you feel the control that comes with 'seeing' the solution in your mind's eye. When you see the right product. When you finally find what you're looking for, it's like, "Ahhhhh!" ─ a huge sense of relief. But there's a brain-puzzle of a problem with our partner, the search engine. There's too much information at our fingertips. It's a jungle of links and words that can cause us real headaches. The rush of adrenaline we then sometimes feel is because of the angst of not finding what we're looking for. But the search engines are doing their job. They're getting better all the time. They're constantly returning better results. We need to do our job as marketers and help searchers weed through the slog. How? By learning the best practices of Search Engine Optimization. If we don't see what we're looking for in those 2 seconds, we're going to click on another link or hit that back button. Or that dreaded Red X. We're not patient. We know what we want. We expect to find it. We expect the web page we visit to deliver the exact info we seek. We might wait a total of 7 seconds, according to the Content Marketing Institute. But that's all. When we can't find what we need, this of course gives us the exact opposite feeling ─ we tense up, and we frown. The internet is a great partner for helping you find what you need. Never before in the history of mankind can we scratch our buying itch like we can today. So many possibilities. But this article isn't all about Business-to-Consumer (B2C) shopping, it applies ─ in every way ─ to all Business-to-Business (B2B) transactions. They're not so different! Why? Because in every case, all transactions are about Business-to-People (B2P)! 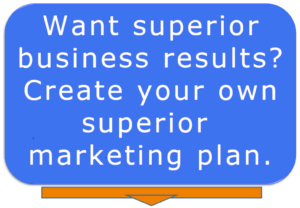 So, no matter your business marketing need, you can know how to help guide your marketing staff. And your target audience. How? Now that we're in tune with how we feel when we shop online, how does this translate to methods of attracting the MOST RELEVANT prospects to our websites? How do we help them find exactly what they want? How do we attract prospects? How do we maintain relationships and guide them into becoming customers? How do we duplicate that smile that comes to our faces when we find what we need in only a few seconds? We serve the active mindset of the online searcher! Before you create your site, or as you're re-creating your pages, take plenty of time to know your target audience. Create 'buyer personas' (write out the personal traits of your ideal customer). Learn the language of your people, and then reflect that back. Reflect the language on your web pages, your social media presence, your brochures, white papers ... Any publication of the company. All company marketing works together, reflecting Google's rank criteria of Expertise, Authority, and Trust (more about this in Secret 5). Reflect the language of your target audience. Design navigation so your visitor immediately finds information about your products and services. Leave company information for the about page. Every - single - word, and every graphic, in your copy must be prospect-centric. They must be about what your company can do for the visitor. Think like you would think if searching for a particular product or service. When you click on a link from the home page or from Google, you'd want to instantly find what you're searching for. And you'll want to make the visitor happy they clicked that link. Remember that the visitor will leave your site in 2 ─ 7 seconds if they don't see what they're looking for. Design pages as if you were doing the searching yourself. Design your pages so they are full of RELEVANT information regarding your solution. An important part of the battle is to show folks that what they see is highly relevant to their search. The reason why relevant information is so crucial is that this reflects the language of your target audience. As you reflect the language of your people, Google and the search engines pick up on this. It's not the rank position that's so important, it's that Google sees you're the expert in the particular field for your target audience. This level of expertise also builds your authority with Google and your audience. As your level of authority and expertise grows, so also does the trust factor. Your people trust you more and Google trusts that your information is right on target. Remember, it's not always the search results page rank that's so important. What's more important is building these three criteria ─ Expertise, Authority, and Trust ─ with you target audience. Google not only revealed a method for ranking web pages, they revealed a method by which we all 'rank' each other in every-day transactions! SEO, these days, is much more than tweaking the guts of the website so search engines are happy. Sure, that's a part of it. But it begins with learning the language of your audience, Secret 1. SEO is an important part of building the relationship with your target audience and with the search engines. Let's break down what SEO is for the website of 2019 and beyond. All the factors in Secrets 1, 2, 3, 4, and 5 come together here. SEO is the engine that runs your entire web site and company marketing effort. It's all about learning how to build and nurture the relationship with your audience. Your web pages, social media, chat, online customer service, and marketing pieces should reflect a single effort to engage your target audience. Google and the search engines only love you when they see . They reward you with search results page rankings. Your reward isn't because of front-end SEO tweaks but because of all your concerted efforts. They see the signals from social media that you're building your relationships. higher rankings are due to the combination of your ability to show your audience and Google your Expertise, Authority, and Trust. SEO means so many different tasks these days. SEO isn't about smoke-and-mirrors and behind-the-scenes technical shenanigans. SEO is an important part of your strategy that focuses and magnifies all of your efforts to connect with your target audience. What makes your company stand out against the competition? Your Unique Selling Proposition. Once you define your USP, use this knowledge to make your company and website stand apart from any other. Design your website to show your unique solution to the problem of your audience. And then magnify your words and clarity by hiring a copywriter. Your audience doesn't want to look anywhere else. They want you to be the solution. Deliver your content accordingly! Did I mention that a searcher should be able to find what they need, quickly? I guess you can't say it enough. How do you plan to implement some of these secrets today? What other ideas have you heard? Please let me know in the comments below. Next up in the Wire Harness Copywriting cornerstone content series: Why Hire a Copywriter? 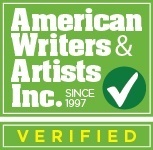 Steve Cass is an AWAI-trained B2B copywriter specializing in wire harness industry marketing. Read more on Steve at the About page. Please pass this along to other wire harness people! Constant education - research - contact. © Wire Harness Copywriting 2018 - 2019. All Rights Reserved. This site audit yields a report based on 8 critical website areas.